What separates the great games from the good games? There’s an intangible aspect of making a game feel fun to play that can be difficult to pin down when trying to describe it, and even more difficult for a developer to create. But when a developer nails it down, it’s truly sublime. 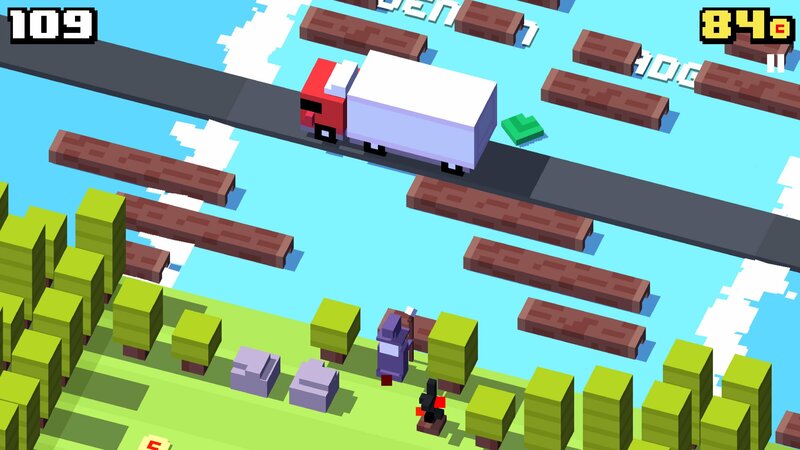 Crossy Road (Free) absolutely nails how a game should feel, which makes it endlessly replayable, and my current go-to pick-up-and-play game. Really, the game is just the same core concept as Frogger, and on the surface, it might be difficult to think how this is so special. It comes down to structure and feel of the game. As the title’s similarity to Flappy Bird may have tipped, there’s a bit of an influence there. The scoring is simply about how far you get, and you have only one life, rather than multiple. I think these changes make the game rather accessible, and built for quick sessions. 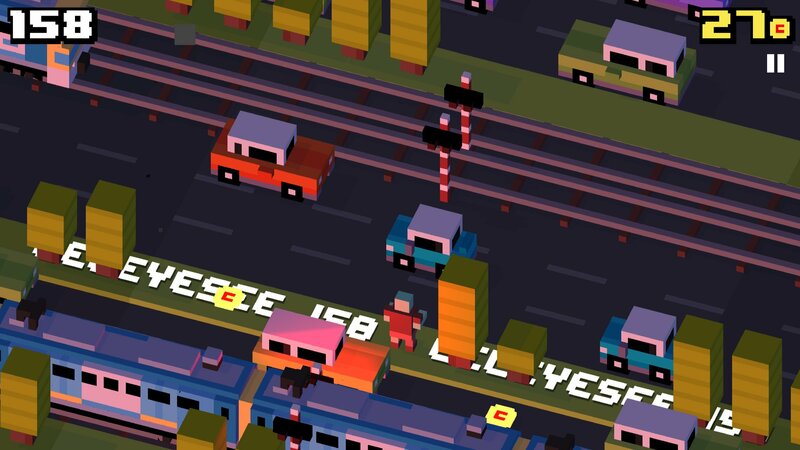 Crossy Road utterly nails how a game should feel. Tapping to move forward has a great feel to it, with just a bit of whimsy to it with the bouncing. When you get hit by a train, you really feel the impact. There’s so many subtle details added to make the game just have a good feeling to it. The characters having their own cosmetic effects goes a long way towards making this game feel pleasing. Having Game Center friends’ scores show up while playing is one of my favorite features, and looks great integrated into the world. Even the retries are quick and with the stylish flash of the title screen to get everything reset and restarted. There’s also the option to “conserve battery" which reduces the framerate, which means that you don’t have to trade battery life in exchange for the stylistic aspects. Either way, the voxel-based visuals are simple-yet-fantastic. 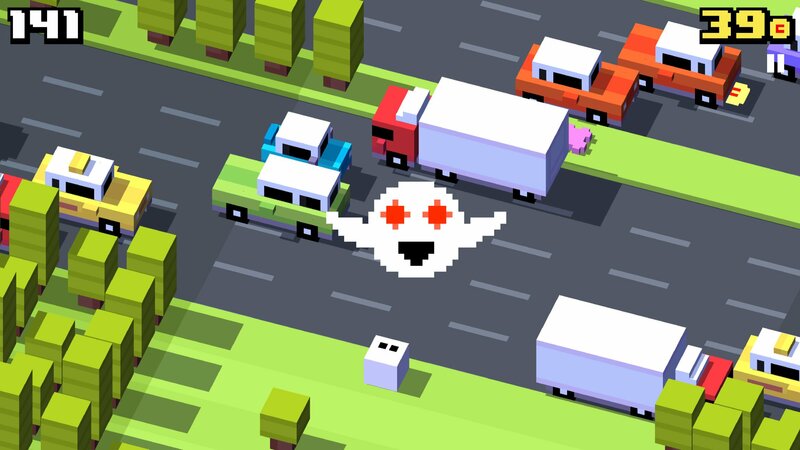 I’ve already seen complaints about Crossy Road‘s free-to-play aspects, and I think the nature of such complaints are utter poppycock. 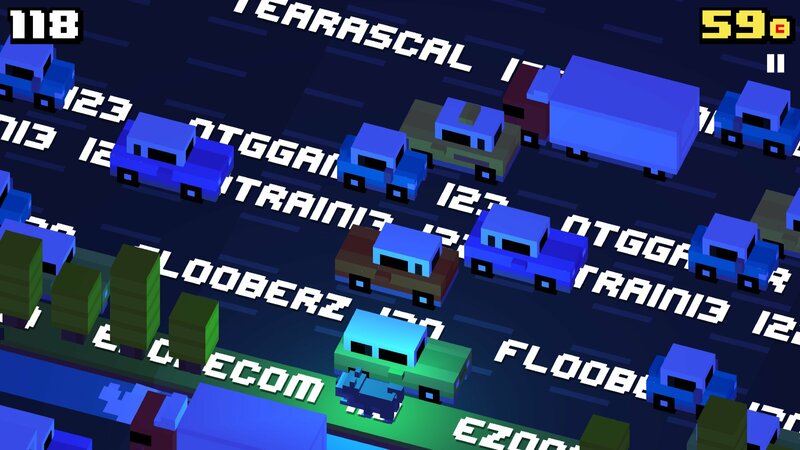 Crossy Road‘s free-to-play monetization is based around playing as different characters, which is pretty much cosmetic. The characters do more than just exist as costumes, like the Mad Wizard will blow up trees, and the eponymous hero of Forget-Me-Not (Free) has flowers to collect. And some characters make the game play at night. These characters can be bought for $0.99 each, or earned randomly in a lottery system, where 100 coins will unlock a new character, with coins earnable through gameplay, video ads, and a regular free gift. The controls work great. Tapping goes forward, with swiping used to go in any of the four cardinal directions. This does mean that going horizontally quickly requires some quick swipes, which isn’t always the easiest thing to do, but it’s also a good reminder that it’s maybe not the best idea to be running horizontally. There’s Everyplay video sharing, but it’s an odd implementation in that it doesn’t record individual runs, it just has an on-off switch for recording. Whether people like this better than recording individual runs is a good question, but it’s definitely unorthodox, and I like the idea of having my best run recorded whether I remember to enable recording or not. At least this means the feature is easily-disabled for those who don’t want it enabled. The game can thankfully be played in any orientation, which makes this great for playing one-handed on iPhone or with a propped-up iPad on a table in equal measure. That goes a long way toward making this game feel so great – it’s adaptable to however you want to play it. The character lottery does give out duplicates, however, and that kind of bugs me, but other than that, this is exactly how free-to-play should work! You don’t get any ads unless you consciously choose to view one. And the aspects to spend money on are 100% optional, you can spend the entire game just playing as the starting character and get the same caliber of experience as someone who bought every single character outright. I think it’s an amazing balance between having those free-to-play elements, but also making them so that players who don’t want to participate don’t have to. Also, I hope more characters make cameos in later updates – there’s just Forget-Me-Not and the hero of Epoch ($0.99) right now, and I’d love for more characters to show up, as games referencing other games is my favorite thing. 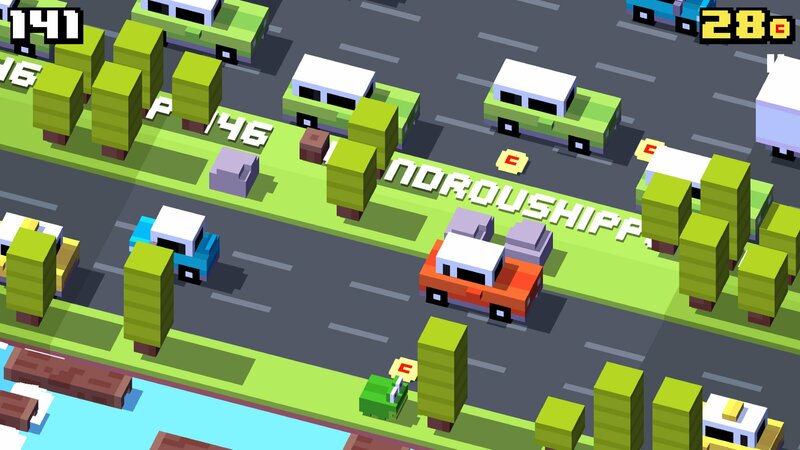 Crossy Road is a simple game, but there’s clearly a lot of work that went into making it one of the best ‘simple’ experiences that can be enjoyed. This is already the kind of game where I’m going back and forth with people for high scores, and sharing my high scores to Twitter. I’ve become absolutely hooked to this game, and I don’t see that ending any time soon. It does a wondeful job at balancing out being accessible, and a free game that both can be played for free, but isn’t necessarily afraid to try and make a little money, either. Play this game.